Background Renal artery pseudoaneurysm following open, laparoscopic, or robotic-assisted nephrectomies is a relatively rare but serious complication. Selective renal artery embolization is an interventional radiologic procedure that can be used to successfully treat this postoperative complication. Case Report We present 2 cases of renal artery pseudoaneurysm, both of which were successfully treated by renal artery embolization, and briefly describe the technical aspects of and clinical indications for this angiographic procedure. Conclusion Unlike other imaging modalities, angiography shows the anatomic location of a pseudoaneurysm so the interventional radiologist can quickly treat this potentially life-threatening condition. Pseudoaneurysms of the renal artery or its branches are relatively rare complications of nephron-sparing surgery, with a reported occurrence of 0.43% to 0.6% for open partial nephrectomies and 1.7% to 2.6% for laparoscopic partial nephrectomies.1,2 In certain studies, renal artery pseudoaneurysms have also been reported as postoperative complications following the increasingly utilized robotic-assisted partial nephrectomy.3,4 These statistics only reflect symptomatic patients. Therefore, the actual rate of occurrence for renal artery pseudoaneurysms could be higher than the literature indicates.1 Both of our cases demonstrate the variation in presentation of renal artery pseudoaneurysms. They can present with the acute onset of bleeding from a drain or surgical wound postoperatively, but typically have a delayed presentation (approximately 2-3 weeks after surgery) with hematuria and flank pain as the presenting complaints.1,2 Both cases also demonstrate the importance of renal artery embolization in successfully treating this surgical complication. 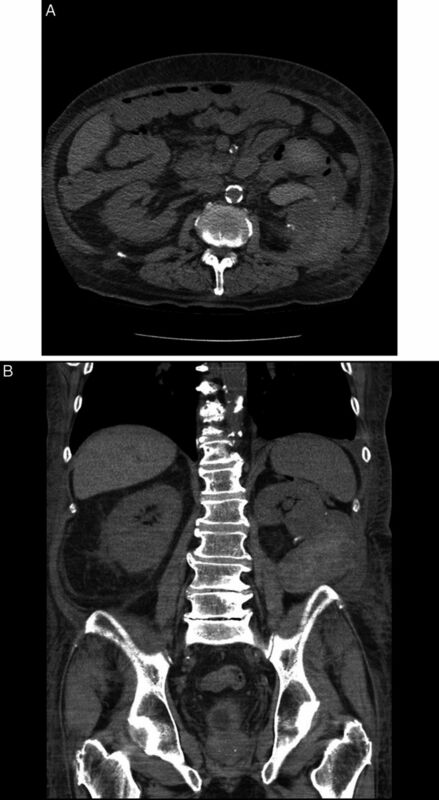 A 63-year-old man presenting with anemia, unintentional weight loss, and rising serum creatinine underwent open partial nephrectomy after computed tomography (CT) of the abdomen revealed a 3.9 × 3.2 cm mass within the midpole of the left kidney. The patient's medical comorbidities included hypertension, diabetes mellitus type 2, renal insufficiency, and atherosclerotic disease. Because of the anatomic location and endophytic nature of the mass, open partial nephrectomy was performed using an extraperitoneal flank incision. Intraoperative ultrasound was used to identify the mass, and complete intraoperative hemostasis was achieved. The patient experienced acute postoperative blood loss anemia requiring transfusion of packed red blood cells and was discharged on postoperative day 3 with a hemoglobin of 9.3 g/dL and a serum creatinine of 3.0 mg/dL. On postoperative day 23, the patient presented with gross hematuria with the passage of large blood clots, as well as flank pain. At the time of presentation, his hemoglobin was 6.7 g/dL. The patient was subsequently admitted to the hospital, and a CT of the abdomen and pelvis demonstrated a left pararenal hematoma (Figure 1). Medical management with transfusion of packed red blood cells was attempted. However, he continued to experience gross hematuria. During cystoscopy, blood was seen coming from the left ureteral orifice. This finding, along with the patient's clinical presentation, suggested a renal artery pseudoaneurysm as opposed to arteriovenous fistula. Noncontrast computed tomography images obtained on postoperative day 23. (A) Axial and (B) coronal images demonstrate a heterogenous mass suggestive of postoperative pararenal hematoma. Interventional Radiology was consulted. Transfemoral renal angiogram demonstrated a large renal artery pseudoaneurysm involving the left kidney which was supplied by superior and inferior branches of the left renal artery. A microcatheter was used to selectivity embolize subsegmental branches from the inferior renal artery branch using a combination of 3-, 4-, and 5-mm platinum-fibered microcoils. Once these vessels were embolized, a large feeding vessel from the main trunk of the superior renal artery segment was identified. Subsegmental branches of this arterial supply were occluded using a combination of 3-mm coils and Gelfoam (Pharmacia & Upjohn Co., New York, NY) (Figure 2). (A) Angiographic images demonstrate a large pseudoaneurysm of the left kidney (arrows). (B) Selective coil embolization of the supplying vessels was performed using 3-, 4-, and 5-mm coils. (C) Final angiographic images demonstrate the occlusion of supplying vessels without evidence of active bleeding. Following the procedure, the patient was monitored in the intensive care unit. His hemoglobin remained stable over the next 2 days, and he was subsequently discharged. Four days after discharge, the patient was seen in clinic and reported no hematuria or complications. The patient's postprocedural creatinine value was 2.4 mg/dL, similar to preembolization values of 2.1-2.6 mg/dL. A 63-year-old male with hypertension, diabetes mellitus, and obstructive sleep apnea underwent noncontrast CT and magnetic resonance imaging for further evaluation and characterization of a previously identified left adrenal mass. Imaging demonstrated a 2.6-cm exophytic mass in the upper pole of the right kidney, suspicious for renal cell carcinoma. The patient underwent robotic-assisted right partial nephrectomy with intraoperative ultrasound without any immediate operative complications. On postoperative day 2, the patient's surgical drain output was noted to be grossly bloody, with a concomitant decrease in hemoglobin from 11.8 g/dL to 7.9 g/dL. Clinically, the patient became tachycardic, diaphoretic, and hypotensive. Emergent right renal angiography demonstrated the presence of a 6-mm pseudoaneurysm arising from a small, laterally directed branch of an interlobar artery of the right kidney. A microcatheter was advanced into the pseudoaneurysm and contrast was injected to better define the anatomy. Several coils were then placed within the aneurysmal cavity. As the catheter was withdrawn, additional coils were placed into a small feeding arterial branch. No further extravasation was present, and only minimal parenchyma was sacrificed (Figure 3). The patient was discharged home 3 days after the procedure. His postembolization creatinine value was 1.6 mg/dL, similar to a preoperative baseline value of 1.4 mg/dL. (A) Angiographic images demonstrate the presence of pseudoaneurysm of the right kidney. (B) Microcatheters were advanced into the aneurysm, and the supplying vessel was embolized with metallic coils. (C) Final angiographic images demonstrate complete occlusion of a small, accessory, right renal artery supplying the pseudoaneurysm. Renal artery embolization begins with a renal angiogram via a transfemoral approach. Selective embolization of renal artery branches can be achieved by using microcatheters inserted coaxially over a guidewire.8 The embolization material should be chosen based on the patient's vascular anatomy and the specific clinical indication or pathologic process necessitating the procedure.5,8 Resorbable materials, coils, inert particles, and sclerosants (liquids) can be used, depending on the clinical indication and vascular structure to be occluded.5,8 The general goal is to occlude the branch with hemorrhagic extravasation while sparing surrounding branches to limit parenchymal damage. Renal artery embolization is a minimally invasive technique for the diagnosis and management of renal artery pseudoaneurysms. Unlike other imaging modalities, such as CT and ultrasonography, angiography not only demonstrates the anatomic location of pseudoaneurysms, but it also allows the interventional radiologist to quickly and effectively treat this potentially life-threatening complication. Both of our cases demonstrate the efficacy of this technique. (6, 2011) Selective arterial embolization for pseudoaneurysms and arteriovenous fistula of renal artery branches following partial nephrectomy. J Urol 185(6):2061–2065, pmid:21496835, Epub 2011 Apr 15. (8, 2003) Renal artery pseudoaneurysm after partial nephrectomy: three case reports and a literature review. Urology 62(2):227–231, pmid:12893324. (3, 2011) Multi-institutional analysis of robotic partial nephrectomy for hilar versus nonhilar lesions in 446 consecutive cases. Eur Urol 59(3):325–330, pmid:21144643, Epub 2010 Nov 21. (6, 2010) Robot-assisted partial nephrectomy: a large single-institutional experience. Urology 75(6):1328–34, pmid:20080290, Epub 2010 Jan 18. (May-Jun 2010) Transcatheter arterial embolization in patients with kidney diseases: an overview of the technical aspects and clinical indications. Korean J Radiol 11(3):257–268, pmid:20461179, Epub 2010 Apr 29. (3, 2002) Successful angioembolization of renal artery pseudoaneurysms after blunt abdominal trauma. Urology 59(3):444, pmid:11880095. (4, 2007) Renal artery embolization: clinical indications and experience from over 100 cases. BJU Int 99(4):881–886, pmid:17166242, Epub 2006 Dec 13. (12, 2009) Transcatheter renal artery embolization: clinical applications and techniques. Tech Vasc Interv Radiol 12(4):224–239, pmid:20005480. (11, 2011) Percutaneous embolization of iatrogenic arterial kidney injuries: safety, efficacy, and impact on blood pressure and renal function. J Vasc Interv Radiol 22(11):1563–1568, pmid:21840226, Epub 2011 Aug 15.